Hi everyone, hope you are all enjoying life to the full, exploring new projects and ideas, meeting up with friends and family and generally looking after your well being. Recently I came across a couple of ideas for pampering your feet which I thought were worth sharing. I loved the detox foot soak but so far haven’t got round to the foot scrub. Combine all ingredients in a glass jar, cap, and shake. When you’re ready to use, fill a container that is large enough to fit both feet in with hot water. Add 1/2 cup of the foot soak powder and stir to dissolve. Place bare feet in the water and allow to soak for at least 10 minutes, but for up to 30. Relax, breathe, read a book, listen to some music. When your time is up, pat feet dry with a clean, dry towel. 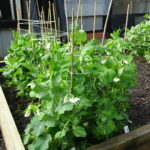 I wonder if any of you decided to make the newspaper pots for planting seeds and seedlings (instructions and video given in my blog of 27th July ). 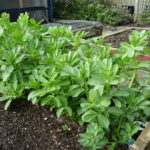 They work really well and even though I thought they may fall to pieces when watering, so far they have maintained their shape. Most of the giant sunflowers I planted have emerged and are doing well. I have since planted some tomato and petunia seeds. By the way, the more pots you make, the easier it becomes to get them square. I found that the final step, which was creasing the points to allow them to want to form the bottom of the pot, is essential for success. Yes, I’ve really got the felt bug. 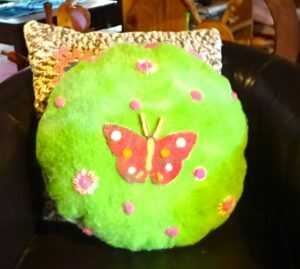 With the assistance of the e-book I downloaded, Creating Felt Artwork, I’ve produced two wall hangings and a cushion which I had on show at the recent Coal Creek Heritage Park craft day. 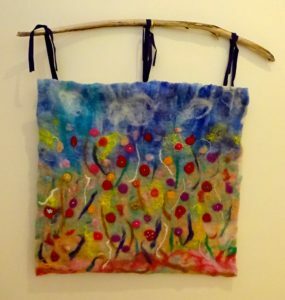 I thought I would look into the history of wet felting and was rewarded with lots of information some of which I have copied here for those interested. Felt is a non-woven fabric formed when sheep’s wool or animal fur is subjected to heat, moisture and pressure or agitation. 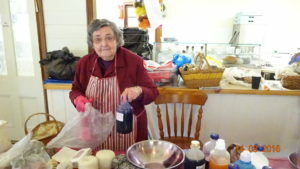 Soap, or an alkaline environment, helps the felting process. Heat and moisture cause the outer scales along the fiber to open, and the soap allows the fibers to slide easily over one another thereby causing them to become entangled. The wool fibers are made up of a protein called keratin. The keratin in the fibers becomes chemically bound to the protein of the other fibers thereby resulting in a permanent bond between the fibers, making the felting process irreversible. 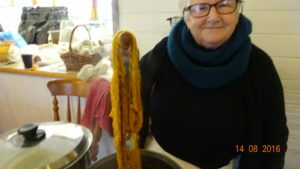 Felting is a simple technique requiring very little equipment. The main advantage felting has over other textile techniques is producing a finished product in much less time. No one knows for certain how humans first discovered the felting properties of wool and animal fur, but several ideas suggest how early humans may have become interested in making felt. Matted wool may have been noticed on sheep. Wool shed from wild sheep may have been found formed into a mass of fibers as a result of the elements. Perhaps they stuffed their foot ware, presumably animal hide, with wool to keep their feet warm. After walking on the wool for a while they found that it became stiff and formed a kind of fabric. The oldest archaeological finds containing evidence of the use of felt are in Turkey. Wall paintings that date from 6500 to 3000 B.C. have been found which have the motif of felt appliquè. At Pazyryk in Southern Siberia archeological evidence of felt was found inside a frozen tomb of a nomadic tribal chief that dates from the fifth century B.C. The evidence from this find shows a highly developed technology of feltmaking. (These felts are in the Hermitage Museum in St. Petersburg, Russia. Some pieces can be seen on the museums web site, www.hermitagemuseum.org) The Romans and Greeks knew of felt. Roman soldiers were equipped with felt breastplates (for protection from arrows), tunics, boots and socks. The earliest felt found in Scandinavia dates back to the Iron Age. Felt sheets believed to be from about 500 A.D. were found covering a body in a tomb in Hordaland, Norway. Today felt is still in use in many parts of the world especially in areas with harsh climates. In Mongolia, nomads live in felt tents called yurts or gers. In Turkey, rugs, hats and other items are made of felt. In South Central Asia nomadic tribes use felt as tent coverings, rugs and blankets. Shepherds use felt cloaks (kepenek) and hats to protect them from the harsh climate. In Scandinavia and Russia, felt boots are produced and widely used. More recently there has been a revival in the interest in felt making especially in Great Britain and Scandinavia and also in the United States with contemporary felt making design and techniques becoming more widespread. 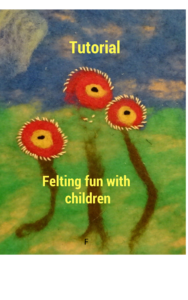 Children love to be creative so having seen the interest that was shown in the felt wall hangings, cushions and hats plus wool dying, at the craft day, I have put together a tutorial for Felting fun with children, which can be downloaded below. This is a quick and fun project to make with children – in an hour or so a child can make a masterpiece! 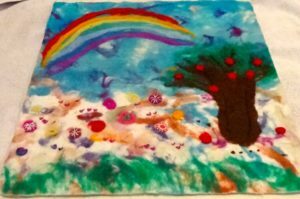 Children love to be creative and wet felting is an easy activity that allows them to do just that. 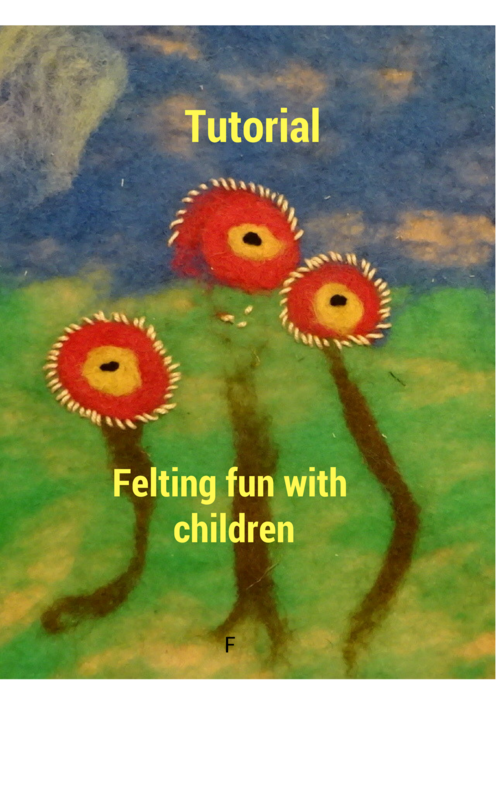 The tutorial will guide you through the steps that are needed to produce a small felt picture. With the help of an adult a child can felt the flowers shown in the tutorial or a design from their own imagination. The only problem I foresee is sourcing the correct wool for felting. Some craft shops carry supplies, likewise Spotlight Stores and internet sites. If you are interested I will be putting together a small kit which will include all you need to make one picture, e-mail me at sbf@dcsi.net.au for details. Add remaining sugar, a tablespoon at a time, beating well after each addition. Lightly fold in sifted cornflour, then vinegar. Line base of a 20cm spring form tin with non-stick baking paper. Spray sides with non-stick spray. Spoon mixture into pan and level off the top. Bake gently for 1 hour. If the pavlova is browning the oven is too hot. Allow to cool completely. Whip cream with 1 tablespoon sugar. 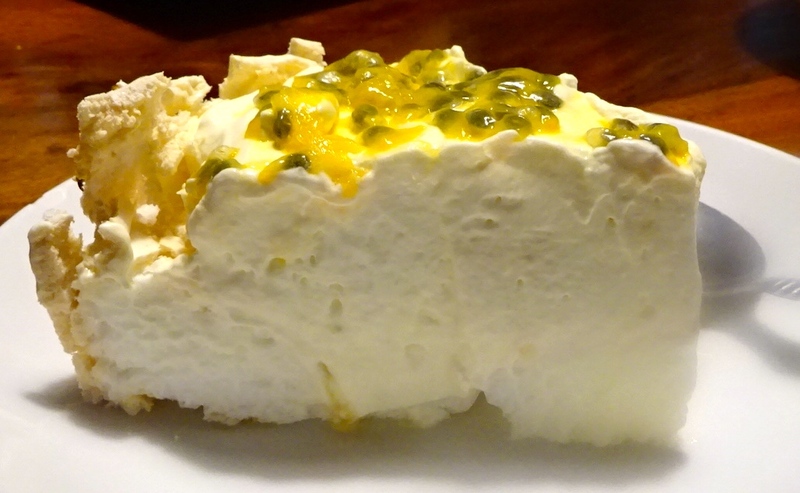 Top pavlova with stiffly whipped cream and sliced fruit. 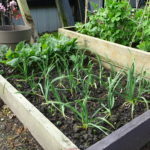 This entry was posted in Enjoying good company, Gardening, Knitting and crafts, Recipes on August 25, 2016 by Janice Graham. I was born in England in 1938 and migrated to Australia in 1976. During my working years, along with my husband Ken, I managed a goat dairy and distribution business supplying health food products. 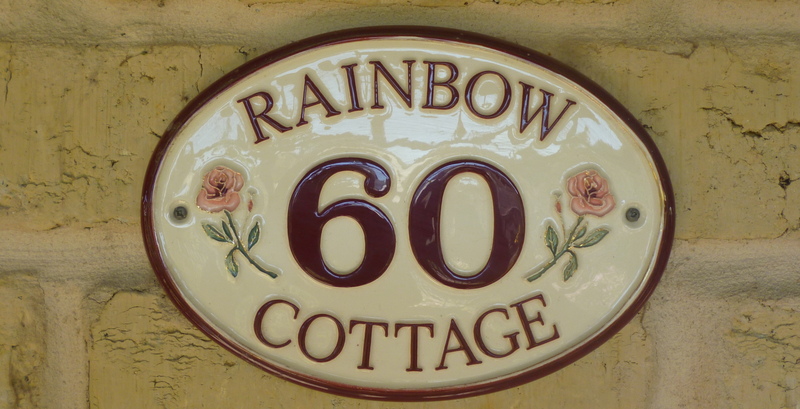 At the same time I took up the challenge of helping build a mud brick home and lived a somewhat 'alternative' lifestyle. Since retirement I have published three e-books, two on vegetarian cookery and a collection of short stories from my younger years. My pastimes are studying the Spanish language, volunteering as a Crisis Counsellor and Community Visiting. I have been married for 54 years, have a son and a daughter and five grandchildren plus a little terrier called Sophia. As usual full of good tips.